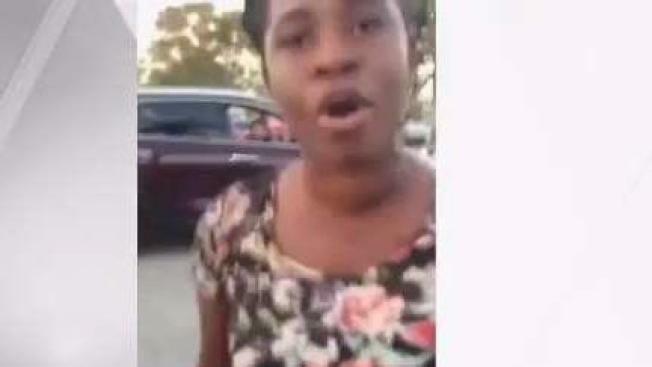 NBC 6's Stephanie Bertini reports on the violent confrontation captured on video in a Lauderdale Lakes parking lot. A Florida woman said she suffered a broken nose when two sisters attacked her with baseball bats in a road rage incident. Mikaela Barboza told the Miami Herald she cut off another driver on Thursday near Fort Lauderdale. The other driver and her sister, who was in another car, began yelling at her. Barboza said she pulled into a nearby parking lot in Lauderdale Lakes because she was worried for her safety. She called 911 when the women followed her and blocked in her car. She started recording on her cellphone as the women approached, Barboza said. They got into a tussle and one of the women hit Barboza with a metal bat. The other hit her with a wooden bat, she said. "When she pulled out that bat, it's just, my heart dropped because I thought, this could be it," Barboza said. "She was hitting me over and over and over." The other women left before deputies arrived. "If it wasn’t me, it could’ve been someone else. They had bats in their cars so something like this, it was like they were ready for it so I just keep them off the streets," Barboza said. Barboza said she is recovering from a concussion, a broken nose and two gashes to her head that required more than a dozen staples and stitches. In hindsight, Barboza said she should have stayed in the car. The Broward Sheriff's Office said they are investigating the incident but gave no other details.